The Wheelabrator Gloucester waste-to-energy facility provides environmentally safe and dependable disposal of up to 500 tons per day of everyday residential and business waste as fuel to generate as much as 14 MW of clean and renewable electricity for sale to the local utility. 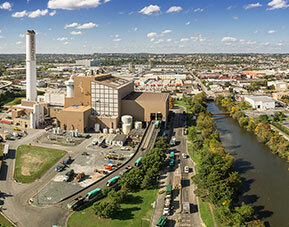 Wheelabrator Gloucester uses this local fuel to create a local-energy ecosystem to supply the equivalent of the electrical needs of 12,230 New Jersey homes as well as its own operations. The Gloucester facility features an enhanced system for recovery of valuable metals that would ordinarily be sent to a landfill. The recovery of these marketable materials will help raise the county’s nearly 42 percent recycling rate—already well above the national average—another feature of a local-energy ecosystem that creates local energy from local waste. As part of the company’s strong commitment and track record of supporting a clean environment, Wheelabrator Gloucester created and maintains a wildlife refuge and nature trail on 150 acres of wetlands surrounding the wast-to-energye facility, including a habitat restoration for the Bobwhite Quail population. The wildlife sanctuary is certified by the Wildlife Habitat Council as a Wildlife at Work site that offers an optimal outdoor experience for visitors while minimizing the human impact on wildlife. Wheelabrator Gloucester partners with a number of environmental organizations to maintain the wildlife sanctuary, including the Wildlife Habitat Council, South Jersey Quail Project, Gloucester County Nature Club, and South Jersey Land & Water Trust. In addition, Wheelabrator Gloucester partners with local middle school students, empowering them to undertake environmental projects that benefit the local community and foster environmental stewardship.